When Robin Simpson adopted Tater, a 1 and a half 1/2-year-old bull terrier, she knew she’d face a few challenges. On top of being deaf, Tater had already lived in three or four homes, and had developed behavioral problems. Much to Robin’s surprise, however, the first six months were a breeze. The young canine immediately settled in with her other dogs and cats, and his behavior needed only very minor correction. Then the nightmare started. “During sleep, Tater would suddenly jump up, and make a sound I can only describe as a roar,” recalls Robin. “He would attack whatever was closest to him, whether myself or one of my other pets.” Once awake, Tater acted as if nothing had happened. While Tater slept in a crate at night, Robin, a veterinary technician at the time, scoured the internet for clues about Sudden Onset Rage Syndrome. She learned that rages can actually be a form of seizure, and a search of an epilepsy site revealed more startling information – some seizures result from a thyroid condition. The site led her to Dr. Jean Dodds, a California-based veterinarian and founder of Hemopet, a non-profit animal blood bank. Dr. Dodds has been studying the connection between abnormal behavior and canine autoimmune thyroiditis for years. Her database contains some 2,000 cases and she regularly consults for vets and clinical laboratories. What is thyroiditis and who gets it? Known as Hashimoto’s Disease in humans, thyroiditis is basically an inflammation of the thyroid gland that runs in families. According to Dr. Dodds, if not treated, the condition almost always leads to clinically expressed hypothyroidism. 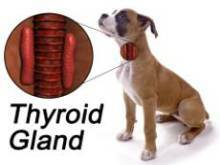 In dogs, the symptoms of hypothyroidism include weight gain, poor skin and coat, and loss of energy. Dr. Dodds’ research shows that some breeds are more genetically predisposed to the disease than others. Those with a relatively high prevalence include the English setter, golden retriever, Shetland sheepdog, American cocker spaniel, boxer, Doberman pinscher, Labrador retriever, German shepherd, akita, Irish setter, old English sheepdog, English pointer, German wirehaired pointer, Maltese, Kuvasz, Skye terrier, petit basset griffon vendeen, and the collie. However, all breeds, including mixed ones (particularly those made up of the breeds above), are affected to some extent. Once the blood test is done and sent to the lab, other factors come into play. “All labs have ranges for normal canine adults. For cases that are not clear cut, Dr. Dodds recommends a six to eight-week trial of thyroid medication. Since the side effects of the drugs are minimal at best (panting, pacing) and it takes only 12 to 24 hours to completely exit the system after the last pill, it seems a safe alternative to a missed diagnosis. 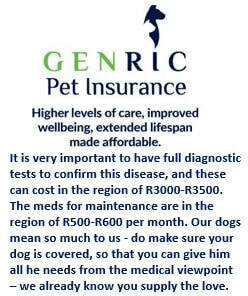 ​For Robin, the veterinarian’s research proved a godsend. “Within a week of sending the bloodwork to Dr. Dodds, we had a diagnosis – autoimmune thyroiditis. Tater began a daily thyroid replacement and his rages were nearly gone after six weeks.” The story has an even happier ending. Robin’s employer was so impressed with Tater’s recovery that the clinic began thyroid testing dogs that came in with abnormal seizure activity (motor seizures, episodes of staring into space or standing in a corner). Almost 100% of these dogs had abnormal thyroid function and improved on thyroid replacement therapy.